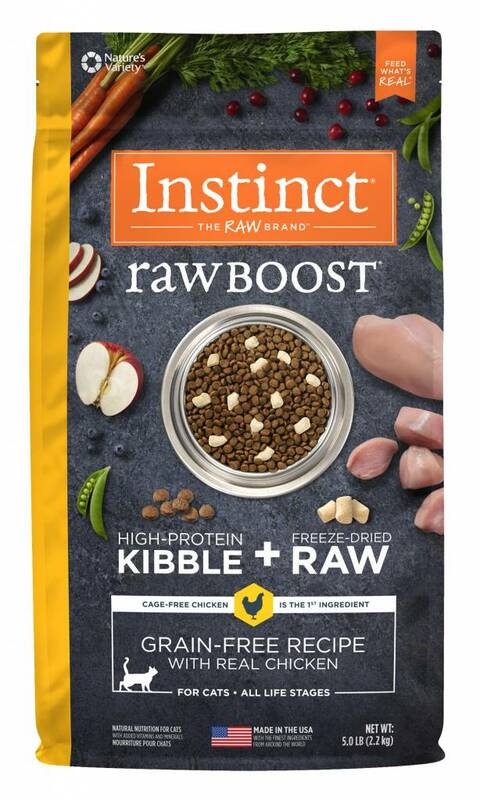 High animal-protein, grain-free, boosted nutrition with bites of freeze-dried raw meat, Instinct Raw Boost Grain-Free Recipe with Real Chicken is a better way to feed kibble. Unlock your cat’s potential to thrive and put more of the pure, real nutrition of raw into every bowl. Chicken, Chicken Meal, Turkey Meal, Menhaden Fish Meal, Peas, Chicken Fat (preserved with Mixed Tocopherols and Citric Acid), Tapioca, Freeze Dried Chicken, Natural Flavor, Dried Tomato Pomace, White Fish Meal (Pacific Whiting, Pacific Sole, Pacific Rockfish), Freeze Dried Chicken Liver, Pumpkinseeds, Salt, Freeze Dried Chicken Heart, Montmorillonite Clay, Vitamins (Vitamin E Supplement, L-Ascorbyl-2-Polyphosphate, Niacin Supplement, Thiamine Mononitrate, d-Calcium Pantothenate, Vitamin A Supplement, Riboflavin Supplement, Menadione Sodium Bisulfite Complex, Pyridoxine Hydrochloride, Vitamin B12 Supplement, Folic Acid, Vitamin D3 Supplement, Biotin), Carrots, Apples, Cranberries, Choline Chloride, Potassium Chloride, Minerals (Zinc Proteinate, Iron Proteinate, Copper Proteinate, Manganese Proteinate, Sodium Selenite, Ethylenediamine Dihydriodide), DL-Methionine, Taurine, Dried Kelp, Salmon Oil, Blueberries, Dried Bacillus coagulans Fermentation Product, Rosemary Extract.